There are numerous reasons to enjoying and visiting Denmark from a bicycle and here are 10 of them to get you going. 1. Beautiful natural areas, fun attractions, places to shop are just a short ride away and you are always near to the next place to sleep or eat in Denmark. 2. The nearly 12,000km cycle routes with clear sign-posts will help you navigate your way around Denmark. 3. The country is covered in bicycle paths and places to park or lock your bike. There is no safer or easier option than using a bike for everything for just getting from A to B or sightseeing or shopping. 4. With the highest point in Denmark being an easy 170 meters, you will not exhaust yourself pedaling up enormous mountains. 5. In event of a repair, there are numerous bike shops that will take the bike and fix it for you on the spot. 6.The country experiences a prevailing westerly wind, so if you are planning this for a holiday, you can ensure the wind is on your back, always. 7.In Denmark, bringing your bike with you on public transport is very easy. 8. Cycling in the big cities of Denmark is quite safe and cycling in the centre of Copenhagen, you can see more bikes than cars. 9.The drivers in Denmark respect the rules of the road and cyclists. 10. 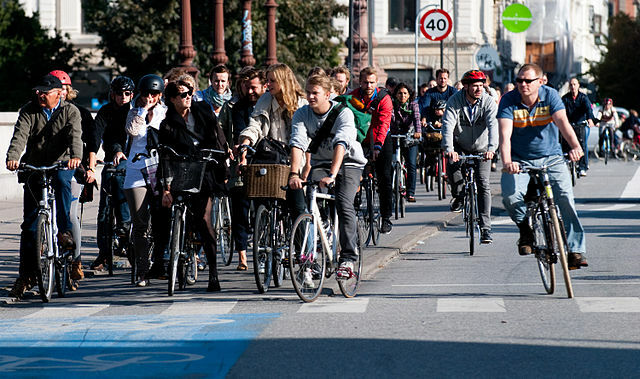 Danes love cycling, so you will not be alone on two wheels. In fact, the best way to experience real Danish culture and to blend in is cycling! So, visit Denmark today for its great tourist spots or if you want to migrate to the country, we can help you with the hassle-free processing of your Danish Green Card!